How do you get the same buzz out of life and career as you did out of sport? How do you win? Retirement from sport can lead to confusion and a lack of identity for athletes, even for those who think they are ready. It doesn’t have to be so difficult. You have the skills for success and now it’s time to train for the next exciting phase of your life. Get the methods and exercises used with clients – individuals who have a desire and a commitment to move forward, to change direction, GET RESULTS and create a successful life. Overcome low self-esteem or confidence and regain a feeling of invincibility …….and more. 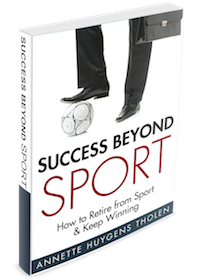 If you are ready to make changes because you are not happy with your current results, if “fine” is not good enough, or you want to continue to grow, then “Success beyond Sport” can help you with that. Annette has tackled the fear, uncertainty and overwhelming responsibility that an athlete faces at the end of their sporting career, head on. Her 8 winning points and Success Training Exercises will guide you along your new journey as you begin to experience success off the sporting field. She will show you that when you retire from competition, you never have to retire from winning. Contact Us about bulk purchases of the book for your organization. “Annette, thank you so much for writing such an awesome book. Now that I’m retired and I’m coaching other athletes in beach volleyball I can use this book as a very REAL reference on how to approach their journey in sport and beyond. Anyone reading this will not only learn how to maximize their potential on the court while they are still playing, they will also have some fantastic tools to use upon retiring from sport and beginning a new career. You have certainly captured the absolute essence of “winning” in a way that doesn’t necessarily mean Gold. You’ve explained how people can win in life and win within themselves. Because, at the end of the day, it’s all about being the best YOU can be. You have written it with such honesty and directness that any retired athlete can identify with. I have had moments exactly like you’ve explained and would have loved to have read your book back then!